When I went into the chemist next door and asked the assistant if she knew when this coin wash opened, she laughed in my face. The launderette in Hoxton has been closed for years and the speed queen was dethroned long ago, I discovered. 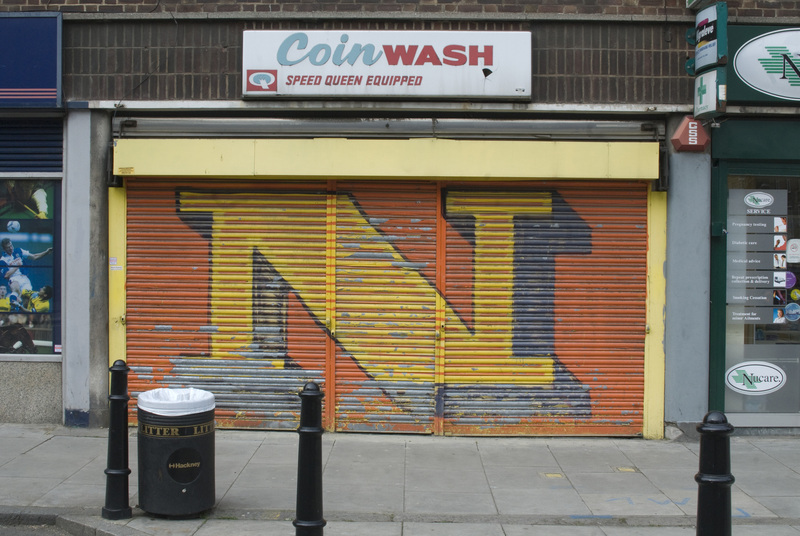 This enigmatic shutter painted by Ben Eine is now the portal to a lost world that will never open again. Let me explain, I was so impressed when I visited the Boundary Estate Community Launderette recently, that I invited photographer Sarah Ainslie to accompany me on a tour of the other neighbourhood launderettes in anticipation of savouring the delights on offer, but it proved to be an elusive and contradictory quest. On the other side of Arnold Circus from the Community Launderette stands the former Boundary Estate Laundry as a reminder of the origins of this culture, when pools, bathhouses and laundries were established in the nineteenth century to improve the living conditions and hygiene of people who lived in the East End. Ironmongers Row Baths still functions as a majestic architectural temple to the benign qualities of water, providing an environment for relaxation, a medium for exercise and the means to get your clothes washed too. This is the last place where you can still take a bath or have a swim, and get your laundry done at the same time. We also visited the York Hall Baths which has a plate in the entrance announcing Baths & Laundry, but while the baths have been spruced up in recent years the laundry has been shut down. Sarah and I peered furtively through the whitewashed window in the Cambridge Heath Road at the ranks of gleaming machines that will never spin again. Although the coin wash in Hoxton is gone, over in Hoxton St, we were relieved to find The Laundry Room open and welcoming with its cheerful daffodil-yellow livery. Here we were received by Eileen Long who has been running the place a few years and keeps it spotless. Having lived in Hoxton thirty-six years, Eileen is a proud advocate of the place and is passionate about local history, explaining that she once lived in the flat on the site of Benjamin Pollock’s Toy Theatre Shop. Eileen confided that, years ago, when a notorious East End gangster put his hand upon her head and offered protection from those who might abuse her on account of her height, she rejected the offer outright because she has always stood up for herself, winning respect in the neighbourhood that she enjoys today. On a Spring morning, The Laundry Room is a pleasant place to spend a few hours, pass time or read a book and strike up a random conversations with whoever passes through, but I noticed it was open twenty-four hours and when I asked Eileen about night-time she rolled her eyes mysteriously. 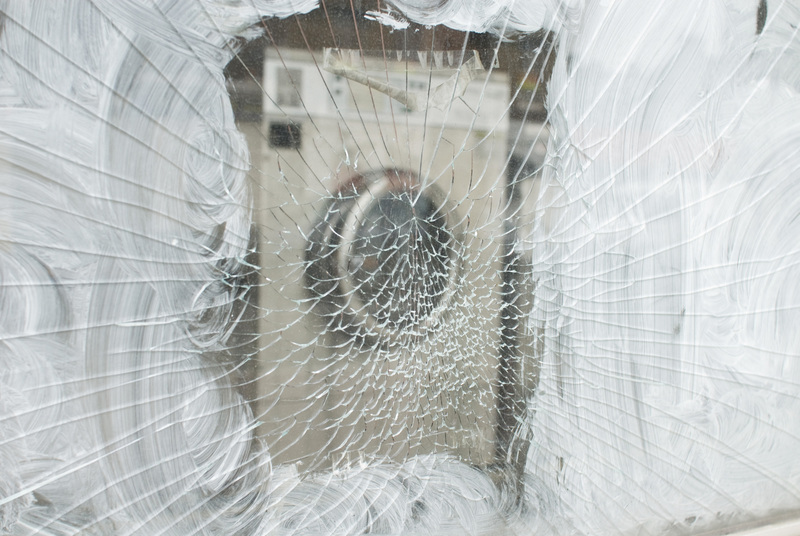 As we travelled East, I regret to report we encountered launderettes empty of customers with cracked panes, where a pervasive melancholy reigned and I could not but wonder how long these will last. Yet on each occasion we were welcomed by generous women who had found it within themselves to preside with kindness. 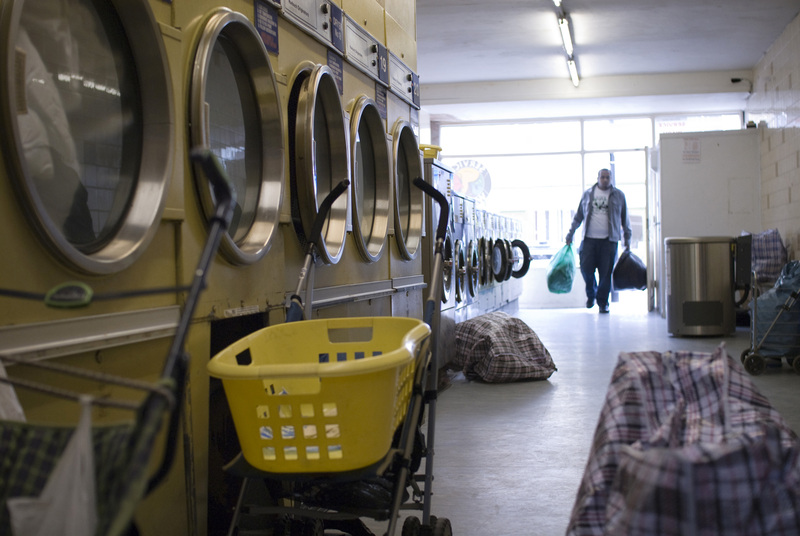 I love launderettes for the spaces they provide where people can be comfortable together even as strangers, enjoying innocent camaraderie, and spending time outside the home in a relaxed place of social possibility. 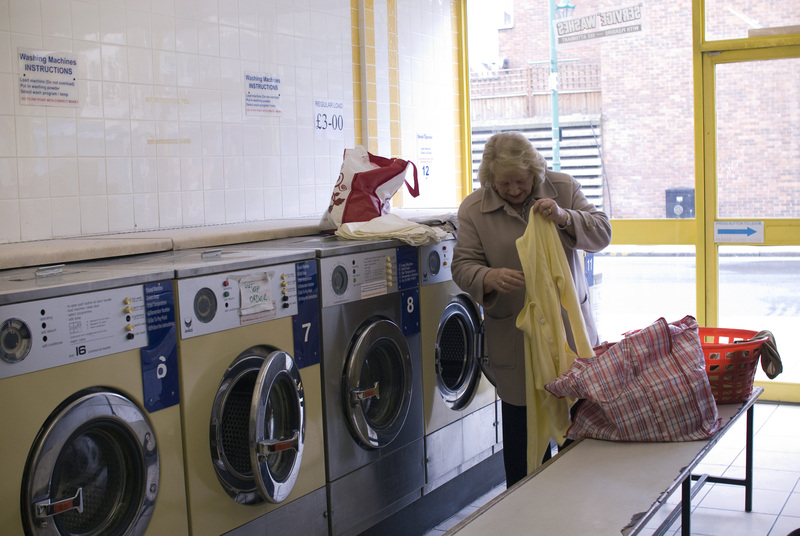 At The Laundry Room over in Broadway Market, we were delighted to be greeted by Nency, a white-haired woman with gracious old-fashioned manners, who told me she was accustomed to regular visits from photographers. “They tell me it’s classic. I asked my daughter, ‘What is classic?’ and she said, ‘It’s when something cannot be improved upon.’” Nency declared with restrained irony. 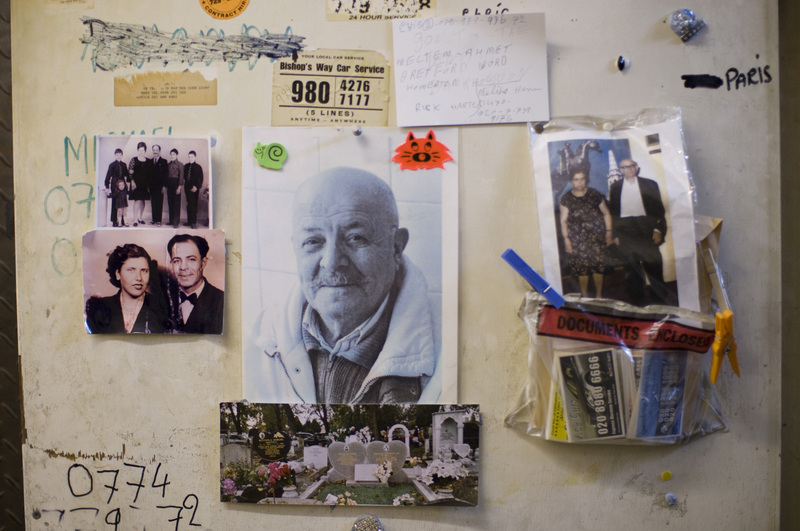 She showed me her private shrine on the reverse of the store-room door, that commemorates the love of her life, Mustapha, known as Jimmy, who came from Cyprus to steal her heart in 1950. Nency keeps these photographs here as a constant reminder, recording Nency and Mustapha as a happy young couple, Nency and Mustapha and their children, Nency and Mustapha as a senior couple, Mustapha as she last remembered him and Mustapha’s grave. All of the joy and heartache of life in five photographs on the back of a laundry door. Over at Smarty Pants in Bethnal Green Rd it was another story. 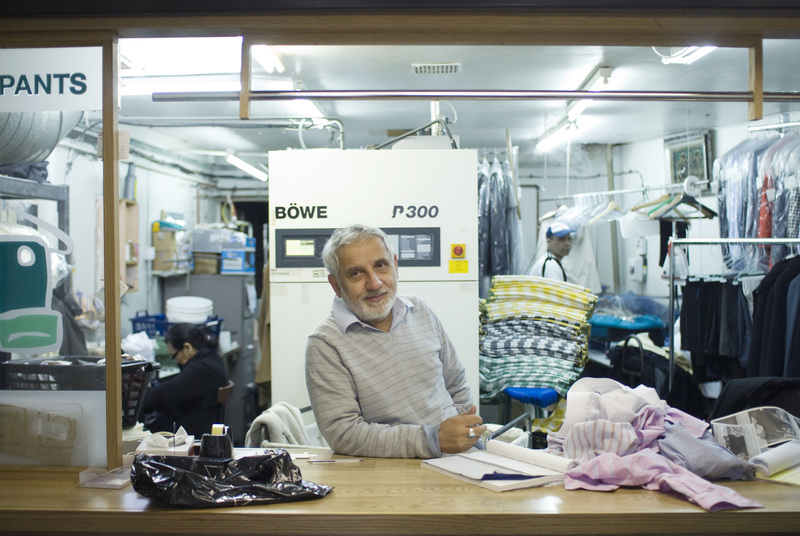 Owner, Mr Patel, with impressive initiative, has lived up to the name of his business by diversifying into dry cleaning, repairs and alterations to create a thriving trade. “These girls will tell you what kind of service I give them!” he announced with a glint in his eye and his customers within earshot. “Oh yes, he always offers us a cup of tea if we want it and always does our repairs on time,” confirmed Linda enthusiastically – as she tipped soap powder into her machine – just in case there could be any misunderstanding. 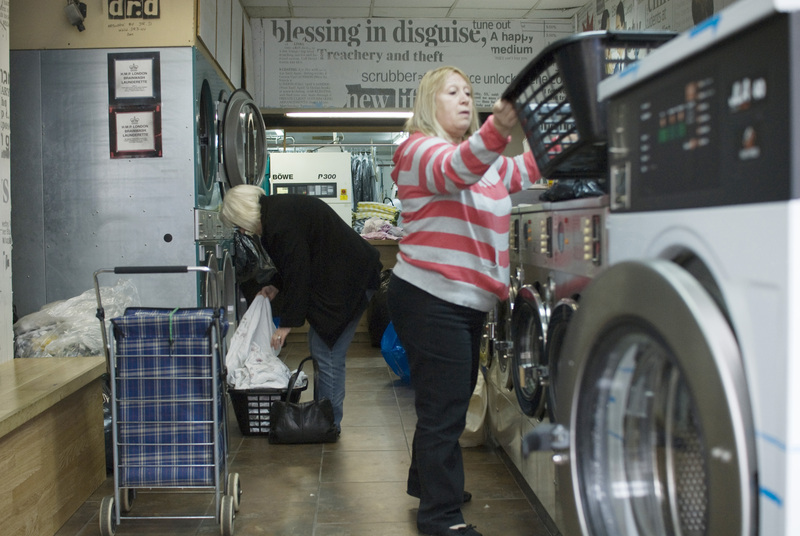 Like the community minded residents of the Boundary Estate, Mr Patel has proved that there is a future for the evolved launderette, but I have hopes that those where Eileen, Nency and all those other fine matriarchs preside will be with us for many years to come because they still have devoted customers. 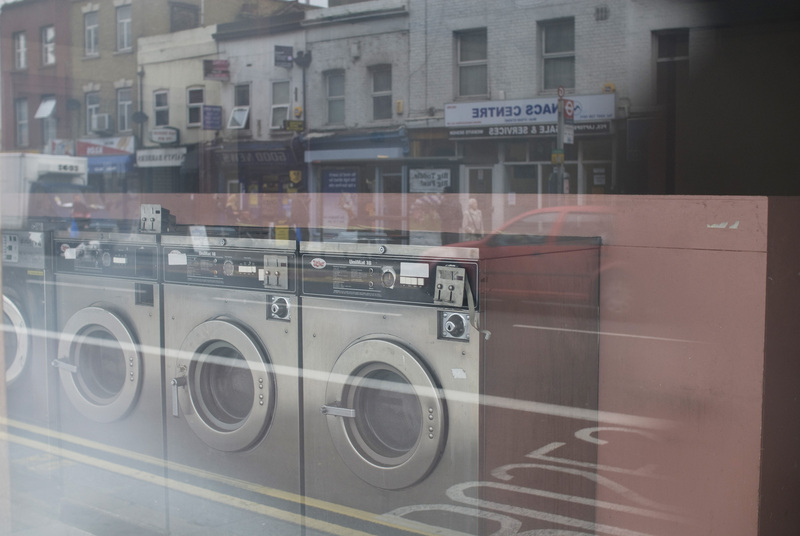 Nevertheless, I have spared you pictures of those that are closed and those that are open but always empty, because it seemed shameful to air the dirty laundry in public and I did not want to write an elegy for launderettes. 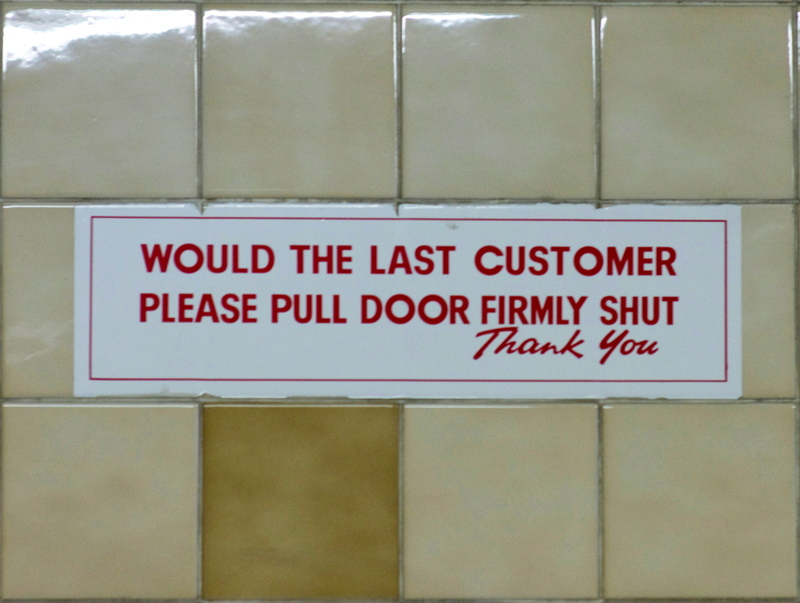 You must not let me pine for the lost world of the launderettes, because they are the epilogue to a series of social changes, taking the East End from the unsanitary conditions that induced outbreaks of cholera, to become a place where today almost everyone has bathrooms and washing machines at home. It will suffice to know there is still one launderette somewhere, just in case my washing machine breaks or if I should need the spiritual consolation of human company one quiet morning. I recommend the inspiring laundry stories at http://spinningstories.wordpress.com as further reading. Eileen, manager of the The Laundry Room, Hoxton St with her daughter. 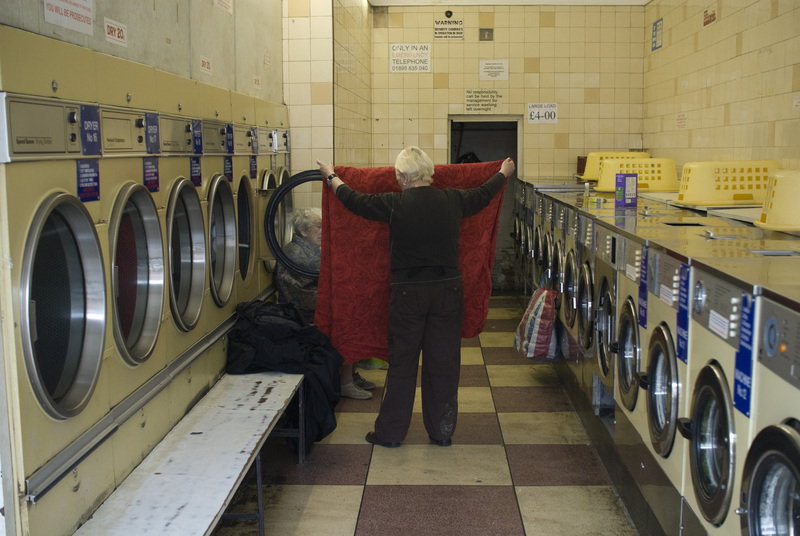 Maggie folds in the Wash & Spin & Dry in the Hackney Road. 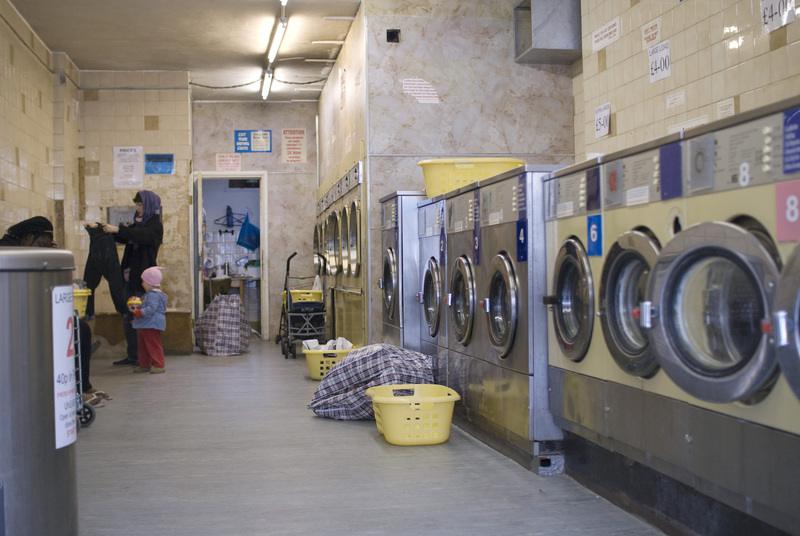 A glimpse into the lost launderette in the Cambridge Heath Rd. Mr Patel proprietor of Smarty Pants in Bethnal Green Rd. Thank you for your salute to laundrettes, or laundromats in US coinage. I visit the local laundromat whenever I have rugs or something heavy to wash, and I never fail to observe some fascinating slice of life. For ecological and space reasons we removed the washing machine from our summer cottage and I happily visit the laundromat in town. It is a lively social scene of locals and tourists, people helping each other fold up the big bed covers, grannies offering advice to young bachelors, children riding around in the baskets, and stacks of old magazines with the good recipes tantalizingly torn out. Yes I too have a special interest in laundrettes as I have just bought a flat above a laundrette not in London, but Eastbourne and they are still an important service for a lot of people in flatland.The Eastbourne Laundrette has free newspapers and sweeet little seats outside.i look forward to visiting the ones mentioned in the article.